Welcome to the dark side. 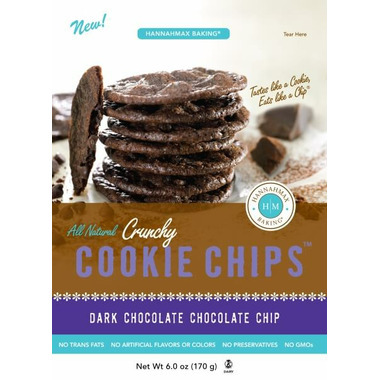 The ultimate DARK CHOCOLATE CHIP CRUNCHY cookie experience starts with the richest dark cocoa on the planet blended with melted dark chocolate, and finished with a hint of Mediterranean Sea Salt. Ingredients: Unbleached enriched wheat flour (niacin, reduced iron, thiamin mononitrate, riboflavin, folic acid), brown cane sugar, unsalted butter, dark chocolate (sugar, chocolate liquor, cocoa butter, soy lecithin [an emulsifier], vanilla, salt), cane sugar, cage free eggs, cocoa powder (processed with alkali), water, vanilla extract, sea salt and baking soda. Contains: wheat, milk, eggs and soy. Manufactured in a facility that processes other products that contain soy and tree nuts. I'm Really ton on these. When you first bite into them, they're great. Super chocolately and crunchy. However, I found that as I chewed, hey became more and more salty tasting, until by the time I swallowed, almost all I could taste was the salt. Great initial flavour, aftertaste not so much. Wow! Delicious and decadent treat! When I first opened the bag I thought the cookies were going to be larger in size, but from my first bite, each cookie packs a punch of chocolatey delight! So crunchy, yet sooo chewy. So chocolately and SOOO DELICIOUS! I absolutely love these, they are a better than any over processed cookie on the market. They are a very convenient snack, so they end up finishing very fast!